I think ghost and demons are managing the electrical systems of Haiti. There are two light bulbs in this photo. The one to the rear is bright, while the ceiling one is dim. This photo was taken in a Hotel in Les Cayes, Haiti that has a generator. The hotel has the electrical plugs connected to a different power source than the fan and ceiling light. 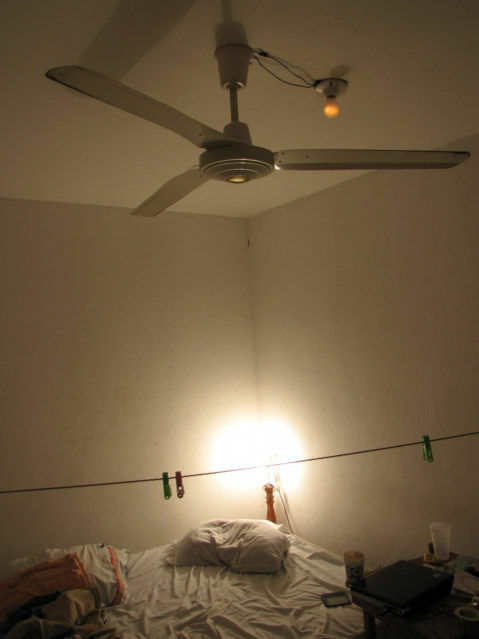 Normally in this situation, the electricity would completely stop for the fan and ceiling light. The fan did stop, but the light is still on very dim. Brownout, Blackout, Dimming… not easy to explain. I just returned to Port-au-Prince, Haiti from Les Cayes, the electricity here is even stranger. In my past life, I had a general contractors license, I did an incredible amount of construction work, to say the least, my mind understand electricity, gadgets, electronics and toys. I know, they did not realize what happened, the problems occurred, they did not cause major problems, and their minds did not recognize there was a problem. Also they believe problems do not happen in modern country, while they expect them in the under-developed countries. They think expensive Hotels do not have problems while cheap ones do. The truth is, it is electrical problem are random, truly difficult to understand, they are in in all countries, however worst in older buildings. Hmm, you say your uncle rewired your house, that is nice, is he an electrician? The last time I was in Port-au-Prince in the Executif Hotel, the lights would go out at night, day, whenever they wanted to, the complete electrical systems would stop. This would be coordinated with the streetlights, when the city block went off, so did the Hotel. Now, the city block goes off and instead of shutting off the Hotel, the power drastically decreases. One minute the fan is blowing hard, then it shifts into low gear, it is still working, but it is slower. The lights dim, sometimes it complete shuts down between cycles, then instantly starts in slow gear. I would like to think the managers of the Hotel flipped a switched. I know they are not that responsible, it is automatic; something is allowing this system to switch back and forth while still connected to the public utility company. Normally, when the lights go off, you can hear a generator start, the gas motor takes off and the electricity is restored, not good, but there is electricity. There is no generator in this Hotel, this is a first, the city somehow allows the electrify to flow to this particular hotel, but at must lower voltage or intensity. In a country like Haiti, you can almost assume a window air conditioner is going to be noisy. We burned up a couple of Hammer Drill by using 200 hundred feet of extension cords in the USA, which was another expensive lesson in Electricity. I now stick with 12 or 14 gauge wire; I make my own extension cords for my Hotel room. No, I do not think an extra power adapter is needed. Although one did burn up in Peru about 10 years ago. Strangely, a guy in the market in Areoquipa rewired it for 3 dollars. I have a HP, because I can find HP in other countries, if you have a Mac or Dell, you can be SOL and may want to carry many things. Heat is the problem, yes. this is the proper focus. Sometimes I hang the computer brick in front of the fan on the clothesline.